From the headquarters in their namesake city, the small crew at Pittsburgh Modular has quickly built a solid reputation. This is thanks to a surprisingly wide selection of Eurorack modules introduced since their launch in 2012, with standouts like their multi-mode filterfinding a spot in many modular rigs. In addition to individual modules, they also sell full-featured Foundation synthesizers built from a selection of their own components. The latest version is the Foundation 3.1, a 13-module system that carries a hefty $2349 price tag. In the Eurorack world, this price is not unheard of. But with more desktop modulars entering the market at much lower price points, there seems to be pressure building on manufacturers to provide an affordable option to serve as an entry-point to the world of modular synthesis. Moog and Make Noise were some of the first to do so, with theMother-32 and 0-Coast respectively. 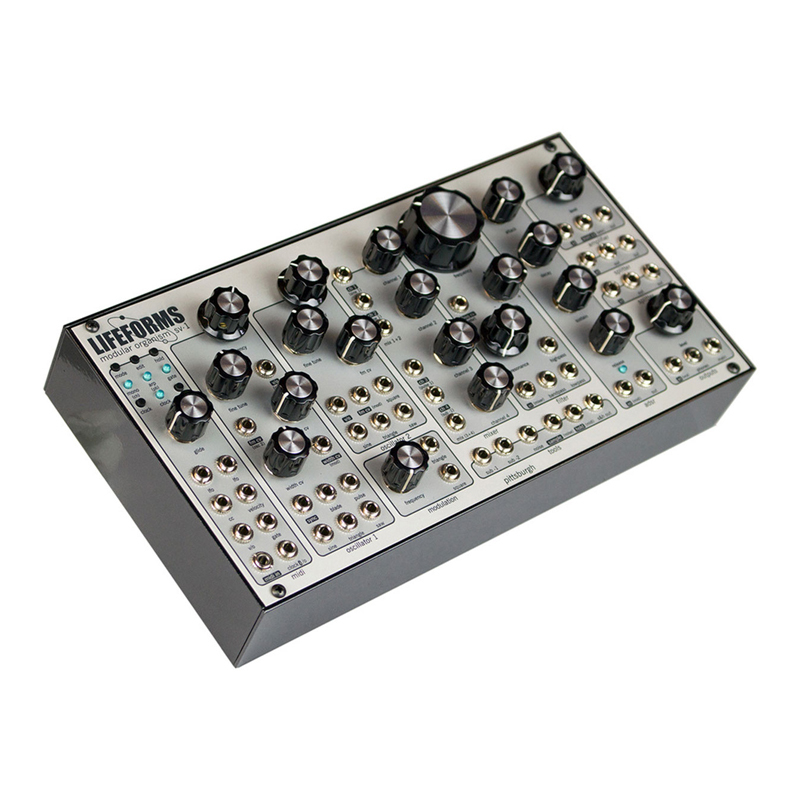 Now Pittsburgh Modular has entered the fray with the Lifeforms SV-1 Blackbox, which retails for around $700. After the SV-1 arrived from Pittsburgh, I immediately noticed that the tuning between octaves seemed to be off, but this improved after about 10 minutes. After doing some research, I found that the SV-1 requires time to warm up before the tuning can be considered to be truly accurate. This is something to consider if you're thinking about using the SV-1 at gigs where you might not have this luxury, but it shouldn't be an issue for most users. One thing you can do while you wait is read the SV-1's manual. I say this tongue-in-cheek but it is a surprisingly good reference that includes some good example patches to get you comfortable with the possibilities this unit provides. From a sound architecture perspective, the SV-1 includes two patchable oscillators with two octaves of sub, a noise source, a dual-chained mixer that can process audio or CV, the state-variable filter, an ADSR envelope and VCA. The oscillators and filter are the stars of the show. With a generous complement of waveform and filter types to choose from, they are powerful both in sound and flexibility. There are a few oddities here, however. Oscillator 1 has a sync input that produces an effect unlike any other hard sync I've ever heard, and not in a good way. The coarse tune knobs for the oscillators have a huge range so that they can do double duty as control sources. This is useful, but it can be a struggle to make small adjustments to find the correct tuning. Finally, the envelope generator is a new design for Pittsburgh Modular, developed to deliver a faster response. This comes with a noticeable click to it, which is not always desirable and during my testing I often found myself finessing the attack time to reduce it. Apart from the sound architecture, the control structure includes a surprisingly detailed MIDI to CV module with two digital LFOs, an analog LFO, a sample-and-hold module and two separate signal splitters. Any desktop semi-modular synth worth its salt has a normalled signal path where the most common connections are made for you internally—the SV-1 is no exception. This means when you first turn it on, you'll be able to play it like a normal synth without needing to patch modules together. The only surprising part of this configuration is that, by default, Oscillator 1 takes up all four channels of the mixer and Oscillator 2 serves as a fixed-pitch modulation source patched to the FM CV input of Oscillator 1. This means that, in order to use Oscillator 2 as a keyboard-tracked tone generator, you need to patch the MIDI-to-CV v/o output to it and then route one of its waveform outputs to the mixer.